Robots (and robot-like toys) have been around for decades, and as the years go by the technology continues to improve. There have been military robot dogs, that are specially made to be able to travel on all types of terrain, and do so better than things moving on wheels or treads. But as the years have passed, manufacturers have made consumer robot dogs. Their movement has become more “natural”, and the controls and commands become easier and more intuitive, and the toys themselves start to seem less like an electronic device and more like a pet. It makes sense, then, that companies would start making robots that are supposed to be pets. 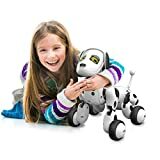 Robot dogs are among the hottest toys on the market, and the best ones are not only fun to play with, but they can also help your kids learn. They can offer the feeling of caring for a real pet, without the extra expenses and responsibilities of feeding it and cleaning up after it. You’ll see three types of robot dogs on the market: 1) those that have a leash--which actually is a set of wires that convey the signals to the dog, 2) those that work on wireless remote control, which is usually radio or infra-red technology, or even by means of a smartphone app. Finally, there are also 3) robot dogs that respond to various stimuli, such as petting, scratching or verbal commands. You’ll see that robotic dogs will use a combination of the above controls. “Lifelike”: “Lifelike” might not be the best term, because you’ll never forget that you’re playing with an electronic toy, but some models are clearly designed to look as close as possible to real-life dogs, with ears, faces, and other features. The Hasbro FurReal Friends Get Up & GoGo robotic dogs have a plush fur, which gives them more of a lifelike appearance. 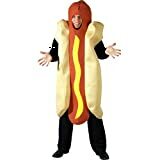 “Artificial”: While some manufacturers seek to make robot dogs that mimic real-life dogs, others go in another direction. “Artificial” robot dogs have four legs (and usually a tail), but they lack other identifiably canine features. This isn’t a flaw; it’s just an alternative design. They'll have an entirely plastic exterior, but a lot of work has been invested in their range of responses: they can bark, jump, pant, and even express emotions according to the stimulus they receive. 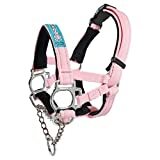 By means of a leash: These will have a leash, which really houses the dog’s remote control. The Hasbro FurReal GoGo My Walkin' Pup has a detachable remote control "leash" by means of which you can give it instructions to walk, bark, and wag its tail. If you pet it on the head, it will bark, while if you pet it on the side, it will turn to meet you. It also has a bit of unpredictability in its reactions, like a real dog. By means of remote control: The FurReal Friends GoGo also can be programmed by means of a smartphone app. Once you purchase a FurReal Friend, you can go to the appropriate Google site and download the app for your pet robot dog. The app allows you to connect with your toy with an Android device. It will increase your robot dog's range of activities. You can style your pet with various accessories, play interactive card games, and more. Interactive: These are not really “remote” control: these are robot dogs that interact and can be trained by means of sensory perception--almost like a real dog, who learns from positive reinforcement of petting and the like. The Zoomer Pup Zuppy Love series of dogs are an example of such an upgrade from remote control robots: These dogs are sufficiently sophisticated, that they respond to how you treat them. They are provided with sensors in their head and chest, which respond to your petting the dog. The dog makes sounds according to its mood, and even responds with its expressive eyes. Understandability: Many robot dogs are advertised as being interactive. They can play music and even talk to the user. However, for that to work, the dog’s voice and other audio needs to be comprehensible. The best brands feature clear, understandable audio. 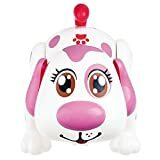 Some customers noticed that the Zoomer Zuppies robot dogs respond better to adult voices than to children’s voices--that might be a cause for frustration in some children. There is a mode to play music, called Music mode. There is also a Guard Mode, where it will protect your belongings. There is also a Socializing Mode: if you introduce your puppy to another Zoomer Pup, your pup can be made to detect the presence of another dog. They'll interact with each other by talking and singing songs. You activate this socializing mode by rubbing the two dogs’ noses together. The Tekno robotic pets are also programmed to interact with other pet robots (of the same brand). Intuitive Use: A number of reviewers point out that the directions that come with robot dogs can be difficult to understand. This isn’t necessarily a problem, so long as the toys can be used out of the box without too much difficulty. The best brands can be taken out of the box, turned on, and used easily by children. 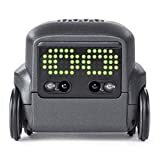 Some customers complained that the interactive games that you can play with the dog are not very sophisticated--they are appropriate for a 6-7 year old, such as memory games, or preparing “food” for your robot. 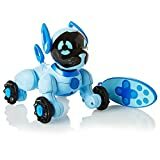 Safety concerns: Even though these robot dogs are meant for fun, and don’t require the care that a real dog demands, the child still has to have a certain level of maturity to enjoy this toy. 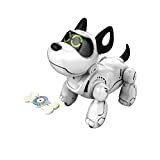 Most robot dogs are recommended for ages 5 and up (there is also a risk with small children ingesting very small parts of the animal). Movement: While no robot can completely mimic the movement of a real dog, the best models feature movement that at least reminds users of the real thing. They can have articulated legs, that allow them to bow, play dead, and roll over, like a real dog. Many will respond to particular hand movements, to sit, bark, jump, roll over and play dead. Noise: One of the main things reviewers talk about with robot dogs is the noise level. The best models work quietly (or at least as quietly as possible), while others can be distractingly loud. Some dogs have a music function, where they’ll play music according to the stimulus you give them. App’s Compatibility with Android phone: There are mixed reviews for the Google apps for the robot dogs. It seems that it depends on compatibility with the type of Android. Some customers were very pleased, and the games worked without a glitch. On the other hand, some people noticed that the Google app would crash their phone! On the other hand, if you can get a tablet that runs the apps properly, you can expand the dog’s functionality by a lot: you can select the eye patterns, movements and types of sounds that the dog makes, by means of the apps. Robot dogs for adults: Besides making a line of robot dogs for children, Hasbro has also come out with a line of robotic dogs for adults. This product answers to a definite need in the elderly, who may feel isolated for much of the day. Since the dog is programmable, it can be made to respond differently to stimuli. But, unlike a real dog, some say that the novelty of a robot dog wears off quickly--they simply don't have the range of emotions (and even empathy) that a real-life dog can provide. The CHiP robot dog has been programmed to show affection like a real dog--if you hold its front legs, it will start dancing. If you rub your nose against it, it will respond by rubbing you back. Gaining familiarity with dogs: People noticed that a robotic dog can get a young child used to taking care of a real pet--the child will become familiar with the dog’s range of emotions. Also, if a child has a fear of dogs, a robot canine might be a good way of overcoming that. 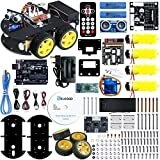 Controls: Check out what kind of controls the robot dog uses. If you’re buying for a younger kid, then you might not want to go with a robot dog that uses a complicated remote control—maybe voice control would be better. If you’re buying for someone older, he or she might like the extra control that a remote offers. The Tekno robotic dog can be “taught” to respond to hand signals: clapping your hands will make it go, whereas putting up your hand like a traffic cop will cause the dog to stop moving. 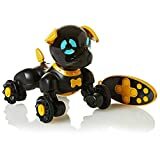 Extras: Robot dogs come with different bells and whistles, so be sure to pick one that has all of the things (movement, music, even games) that will keep your children entertained. 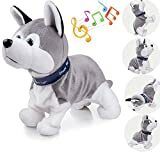 There are also special toys that come along with some dogs, such as an electronic ball or bone. The Tekno Robotic Dog has a “bone” with a directional arrow, indicating which part will be sensed by the dog’s mouth. The bone lights up, and the dog goes through a series of motions to show how glad it is. The ball has a similar magnetic property, so that the dog can “catch” it. “Naturalism”: This one really depends on the individual children you’re buying for. If you think that the child might be disturbed by a robot dog that seems more mechanical, then look for one that looks a bit more like a real dog. On the other hand, you can go with a more “robotic” dog if you think he or she will be interested in something more obviously artificial. Languages: With robot dogs, it’s not only the language that the instructions are written in that is important. Some companies make robot dogs that understand several languages. For example, the Zoomer pups are able to understand English, French and Spanish. Some models can understand Russian as well. It will understand the commands, "Sit! ", "Play dead! ", and "Look at me!". They can also follow you if you ask them to go for a walk. They can even show affection if you tell them you love them! Colors: Some of the Zoomer Pups are not only in different colors: they're even in costume! Prima is in a ballerina's tutu, while Diamond has a glittery diamond ring, and Pixy has enchanted wings like a magical pixie. Batteries vs. charging time: CHiP is your loyal robot companion with all the lovable qualities of a real dog. CHiP shows affection, learns new tricks and loves to play. Roll his ball and he’ll bring it back to you. Pick up his front legs and he’ll dance with you. 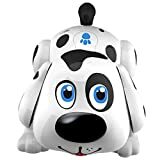 Rub your nose against his and he’ll nuzzle right back.The Zoomer Zuppy pups have a USB connection that allows you to charge them up. But people notice that the charging time is rather long--and even when fully charged, the pup will have enough juice to run for around 25-30 minutes. Some prefer the Zoomer Roxy model, which requires 3 “AAA” batteries. This is more dependable than having to periodically charge up the pet. It will also give you more use at any one time. The Tekno robot dog requires 4 “AA” batteries--you’ll need a screwdriver to insert the batteries and close the battery compartment properly. The CHiP robot dog by Wow Wee has a unique feature: When its battery is running low, it will automatically walk over to its station (called a SmartBed) to get recharged! Zoomer: Zoomer is one of the leading manufacturers of robot dogs. Zoomer is a brand produced by the company Spin Master, which was founded in 1994 by Ronnen Harary, Anton Rabie and Ben Varadi. Their headquarters is located in Toronto, Ontario. Their toys include PAW Patrol, Hatchimals, Bakugan, the Zoomer line of robotic animals, and much more. Zoomer also produces other robotic pets, including cats and dinosaurs. One unique feature of Zoomer pets is that they can interact with one another. Their interactive puppies and “Zuppies” are consistently voted to be in the top 10 best robotic dogs every year. Bandai: Bandai is a Japanese toy manufacturer that was founded in 1950. The company makes a wide range of toys, from traditional models to electronic gadgets and toys (including robot pets). Hasbro: was founded in 1923 by the Hassenfeld Brothers in Pawtucket, Rhode Island, as a business working in textiles. They started to make pencil-box covers and cloth zipper pouches, but they later expanded to plastics and toy making. They are presently the second largest toy maker in the world, and are famous for making Mr. Potato Head, G.I. Joe, and The Transformers. 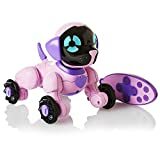 They have also ventured into making robotic toys, with "FurReal Friends" (or just "FurReal" being their brand of robotic pets: dogs, cats, and even dinosaurs. Tekno Robotics: have been making interactive robotic animals since 1999. They have created robotic dogs, cats, toucans, and even scorpions! They are supplied with voice recognition, and can tell jokes, do impressions, and even play music. You can download the appropriate app to your tablet, to play more games and do more tricks.